This post describes how to read the On-Line Field Description Tables (OLFD001.dat & OLFD002.dat) using the c-tree ODBC driver. It is the tool I have used forever to put the table and window names in a spreadsheet for easier access. 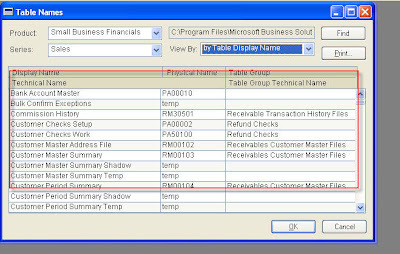 Dynamics GP v 7.5 and prior supported three databases. Pervasive SQL 2000 (Btrieve), FairCom’s c-tree Plus and MS-SQL. Dexterity still supports these formats. If you search the GP folder, you will find a few tables with the extensions .dat and .idx. These are c-tree tables. Although there are others, I’d like to focus on the On-Line Field Description tables. When you navigate to Microsoft Dynamics GP > Tools > Resource Descriptions > Tables, you are reading those files. While you can, of course, access these tables using Dexterity, you can also read them with an ODBC driver. GP used to sell a read-only ODBC driver for c-tree files. I think it was about $300 per workstation. They do not sell it anymore, but you can get it from FairCom http://www.faircom.com/ace/ctpodbc_information_t.php. While we are on the subject of SQL tables, we often need to find records that are in one table but not another. This usually happens after there has been some kind of interruption during a posting process. This can be done fairly easily with a nested SQL query. The first thing you need to do is determine which tables you need to look in (Take a look at our previous article on Integration Basics). It is also worth remembering the process flow through Dynamics( GP) (Work>Open>History). Work tables will start with a 1 after the two alphabetic characters that represent the module/series. And you guessed it, history tables start with a 3. Keys tables etc. start with a 0. I have blogged, preached, pleaded, begged, trained, demonstrated on the same topic for 7 years. I now declare my job impossible. Without the power of a deity - which I clearly do not possess, I simply can not change consultant and developer instinct. Is it possible that natural instinct is wrong? There is a long Darwinian discussion that could follow here. YES - instinct can be wrong. When it comes to Microsoft Dynamics GP eXtender, instinct is wrong. Great Blog Article on the Sales Order Processing Tables! Found this little gem, a great quick reference for Great Plains 10 Table Names! I mentioned yesterday that I had to restore some Item records after making a horrendous change to one of my Unit of Measure Schedules. It occurred to me that not everyone may be familiar with the underlying GP tables, maybe because they are named oh-so-intuitively...NOT!